Much has been written about the decline of the United Kingdom. The Two Unions looks instead at the lengthy survival of the Union, examining the institutions, structures, and individuals that have contributed to its longevity. 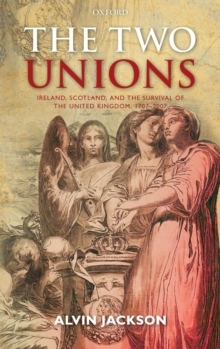 In order to understand its survival, the author, one of the foremost historians of modern Ireland and of the British-Irish relationship, sustains a comparison between the Irish and Scots Unions, their respective origins and subsequentdevelopment. He provides a detailed examination of the two interlinked Unionist movements in Scotland and Ireland. Alvin Jackson illuminates not only the history and varied health of the United Kingdom over the past 300 years, but also its present condition and prospects.